Autumn is here and we're determined to not completely abandon the flirty, romantic aesthetic that goes hand-in-hand with Summer. You're probably thinking, "How is this possible without feeling uncomfortably cold 24/7?" . . . Two words: Autumn dresses. 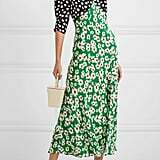 Investing in dresses that have long sleeves, work well with OTK boots or extra layers, or are made from warmer fabrics, will breathe fresh air into your otherwise denim and skivvy-heavy wardrobe. To help kick-start your hunt, we've curated a list of the prettiest Autumn dresses online for you to shop at every price point. Scroll!